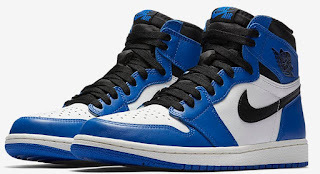 Here is a look at the Air Jordan 1 Retro High ‘White/Royal’ Sneaker available at 10 AM HERE at Foot Action, HERE at Nike, HERE at Footlocker and HERE at Villa. The latest Air Jordan I runs parallel to memory lane. It has a high-top cut, Nike Air branding and colors that splice genes from early Jordan DNA: the 1985 "Chicago" blocking with a new Royal twist. Constructed with rich, full-grain leather, it's a crowd pleaser and a no-brainer that serves up OG love in an all-new way.